03.14.2005 - The majority of the time, pigeon control centers around abatement practices - the installation of physical deterrents that prevent them from roosting in undesirable areas. An example is the installation of pigeon spikes on a store sign in order to prevent them from landing on the sign. However, at times pigeon trapping and removal is a desirable solution. For example the building may be too large in order for spike removal to be cost effective. Or perhaps the pigeons are roosting on or in an area where spikes or other deterrents won't fit or can't be installed. If the birds are trapped and removed from the area, then the problem is diminished. However, trapping and removal is not a permanent solution - if an area is attractive to pigeons, then new ones will choose to live in that area. Wildlife trapping in general is often a temporary fix. In addition, it's usually impossible to get all of the birds. Thus, the remaining ones will stay and nest and create new birds. Still, trapping does have its place and it is useful in certain circumstances. Oftentimes, it can be part of an overall plan to keep the pigeon population down to reasonable levels. 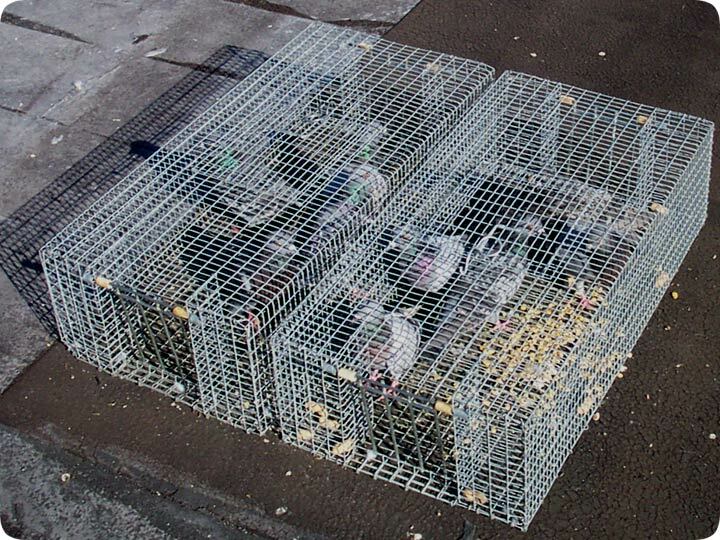 In order to catch pigeons in traps, set the trap in an area where the pigeons are known to congregate, and bait with seed, cracked corn, and the like. Wire the doors of the trap open for a few days if you want to have the pigeons gain trust in the traps and food source. One interesting thing about pigeon trapping is that pigeons are sociable and greedy - thus, one pigeon in a trap will actually attract others. So perhaps when you trap them, you'll want to leave one behind in the trap in order to attract new ones. But don't leave any live animal stuck in a trap for too long - particularly if it's exposed to sunlight - because that's cruel. Then, finally, I should say that pigeons can't really be relocated. They're pretty damn good at navigating their way home. So pigeon stew is really the only answer. Good luck with your pigeon trapping!